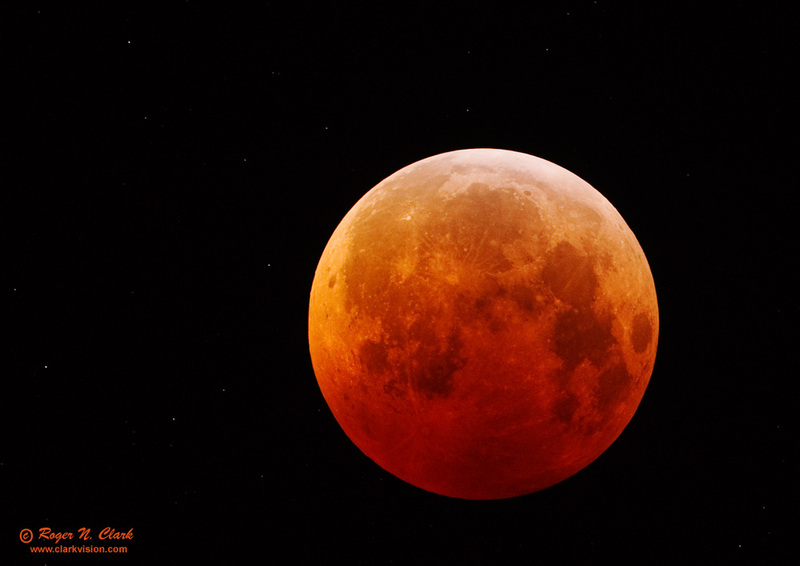 The total lunar eclipse of December 21, 2010 was very dark. The image was taken at 1:27 am MST, 10 minutes after maximum eclipse. Note the many stars in the background. Technical. Canon 1D Mark IV 16 megapixel digital camera. Canon 500 mm f/4 L IS lens. This image is a stack of 3 images to reduce noise, taken within about 20 seconds. Each exposure was 0.4 second at ISO 1600, f/4. Stacking 3 exposures was necessary because the Earth's rotation would have blurred the image if the exposure time was longer. The stack was done in photoshop where each layer was given 33% opacity. The image was deconvolved with Richardson-Lucy image restoration, 5x5 grid, 8 iterations (in ImagesPlus). A final small adjustment to contrast was applied in photoshop. This is a 12-megapixel crop from the original.